Medieval Monuments in Kosovo consists of four Serbian Orthodox Christian churches and monasteries built in the 13th and 14th centuries. They represent the fusion of the eastern Orthodox Byzantine and the western Romanesque ecclesiastical architecture to form the so-called Palaiologian Renaissance style. It has a distinct style of mural painting. 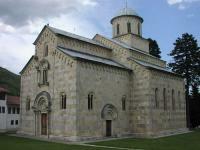 In 2004, UNESCO recognized the Decani Monastery for its outstanding universal value. Two years later, the site of patrimony was extended as a serial nomination, to include three other religious monuments. It was also in 2006 when the property was inscribed on the World Heritage List in Danger due to difficulties in its management and conservation stemming from the region's political instability. Basing myself in Kosovo’s capital Pristina, I visited 2 out of the 4 locations that comprise the Medieval Monuments in Kosovo: Gracanica Monastery and Prizren's Our Lady of Ljeviš church. They are considered ‘In Danger’ since 2006 as they need “urgent conservation work” and safeguarding, due to the post-conflict situation which saw this Serbian WHS end up on the territory of the partially recognised state of Kosovo. In the months prior to this trip I had scoured the Internet for information on how to reach the monastery of Gracanica. It lies just 10 kilometers from Pristina, but in a Serb enclave whose surroundings pretend it does not exist. I was almost deterred by the transport issues described in the Lonely Planet chapter on Kosovo (“Rumours abound that bus drivers won’t let you on or off if you tell them where you’re going”) and the stories that run on Tripadvisor about encountering “unwelcoming nuns” at the monastery itself. In reality it took me a lot of effort and time (2 hours) to get there. But that had more to do with Pristina’s complex public transport system than with the sensitivity of my destination. The networks of city buses and regional buses are not connected, you have to walk several hundred meters between them and it was a mystery to me which bus would stop where. Eventually I ended up on a road behind the Albi Mall on the outskirts of the city, where buses to Gjilan come through that also pass Gracanica. And fortunately they stop there again without questioning: there is a bus stop in the main street, close to the monastery. The monastery no longer has obvious guards. At the entrance of the village I did pass a warning sign though that CCTV is enabled in its main street. The general feel in town remembered me of the Republika Srpska which I visited 2 years ago: many Serbian flags in the streets – to the Kosovars of Serbian origin, this is their religious and political center. The long walls that surround the monastery had one open door, through which I could step inside. Behind it I saw a neatly kept lawn with a perfect little church in the middle (see first photo). I could look around at ease, fortunately there were no suspicious nuns after me and there’s also no entrance fee. Inside the church a nun was busy polishing the woodwork. She did not acknowledge me entering. This is an active monastery, according to its official website ”there are 24 sisters in the monastery who are active in icon painting, agriculture, sewing and other monastic obediences”. The murals are wonderful, and even fully cover the largest of the five domes. At first looking upwards I only noticed the painting of a hand with stigmata, but a huge Christ is attached to it! From the outside the church does not seem that big, but it is very tall. I found it very impressive and its conditon seems excellent. You’re not allowed to take pictures inside, so I just show below one of the murals in Gracanica that I found on the internet. The visit to the second church was a lot easier. Actually, I had it planned as a back-up scenario if my trip to Gracanica didn’t pan out. Our Lady of Ljeviš church is located in the center of Prizren, Kosovo's second city and the cultural capital of the country. By bus from Pristina, a trip to Prizren takes almost 2 hours although it's only 80 kilometers. Prizren is an "ordinary" Kosovar Albanian town, where you can find a lot of mosques and churches of various denominations. If the de facto independent state of Kosovo will ever enter UNESCO and aim for its own WHS, I guess Prizren will be high on their agenda. No hush-hush here about a Serbian-Orthodox symbol: the Ljeviš church is indicated on the tourist information panels around the city just as any other sight. That does not mean the Serbian heritage here is approved of by everybody: the church was set on fire and looted in 2004, and the roof was partially torn down because of its valuable lead. It has since closed. I had read that sometimes a policeman stands guard at the entrance, who could be willing to let you in if you do not look like a Kosovar or Albanian terrorist. But during my visit I saw no one around: the gates were firmly locked and there was barbed wire stretched over all its walls. Peeking through the double gate at the entrance, I could just see some murals under the covered porch. They did not look as good as those in Gracanica, and the interior reportedly has only about 30% of its paintings left. The Medieval Monuments in Kosovo have been under scrutiny each year over the past 9 years to see if the endangered status could be lifted. Although 3 out of the 4 subsites now are under control of the Kosovo police instead of the UN peace mission KFOR, the situation at Decani Monastery is still of concern. The 2015 report sees no possibility for ending the endangered status in the near future, and reinforced monitoring will continue. I visited the Medieval Monuments in Kosovo last week while staying in Pristina. 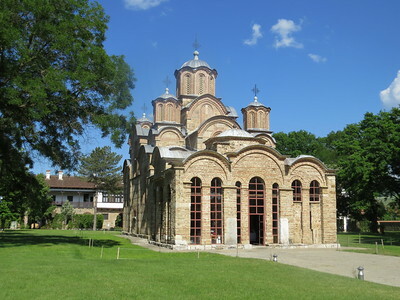 I only had enough time to see Gracanica Monastery, but I very much enjoyed my time there. The monastery is a lot like other medieval Orthodox Churches on the UNESCO list, but I thought the frescoes inside the church were especially vibrant. I did not have a hard time getting there. I read online that the easiest way from Pristina to Grananica was to get a taxi arranged by your hostel or hotel. It cost me 15 euros for a taxi there and bring me back to the city. We visited the Kosovo Monasteries at Pec and Decani in June 2017. In fact, in what was possibly an excess of enthusiasm for Mediaeval Serbian monasteries, we took in consecutively, in under 24 hours, the Monastery at Studenica and those at Djurdjevi Stupovi and Sopocani before driving south into Kosovo from Montenegro on the mountain road over from Rozaje. The drive from Sopocani to the monastery at Pec took around 3 hours including 2 frontier crossings. Pec (Peja) is a surprisingly busy town with a chaotic “anything goes” atmosphere and building taking place everywhere – it isn’t clear how “controlled” all this activity is, and neither is the nature of its economic underpinning! Kosovo has the reputation of being something of a mafia state based on smuggling of goods, narcotics and people with “construction” being a good money laundering method - See . The monastery lies to the west of the town at the entrance to the Rugova Gorge and, as we approached the town, it was obvious where we needed to be - unfortunately the main road came to a dead end at a square, there were no signs for the Monastery and the nearby “Tourist Office” was closed for “Brek”! A taxi driver wouldn’t assist us unless we took him to get there but the receptionist in the nearby main hotel provided a useful sketch map! The monastery at the moment is situated at the very end of building developments extending West from Pecs – it must surely come under greater pressure in future years. At the monastery we had to have our passport details noted by a bored Kosovan policeman sitting outside his hut, who then lifted the barrier for us to pass by with our car (having tried to convince us that the walk wasn’t far – lifting that barrier was such a bother). The monastery is surrounded by a high newly-renovated wall and, on passing through the main gate, we were met by a nun speaking excellent English – “You are the ones coming by car?” It appeared that the policeman’s duties included radioing through the arrival and description of all visitors. Entrance now is 2 Euro pp – the only Serbian monastery we came across with an entry fee. This includes an audio guide with details of 17 different locations both inside and out. Worth listening to, but perhaps excessively detailed in its use of architectural terms and references to Serbian history for the average visitor! Interior photography is not allowed and there are non ecclesiastical “helpers” inside both to help direct visitors to the correct audio numbers and also to “guard”. We were the only visitors, though a small group of backpackers arrived as we left. We really enjoyed the main church – or should I say “churches” as it consists of 3 churches joined together by a “Narthex” (one of those terms you will need to know! ), each being entered in turn from within it, plus a further small church with its own external entrance. The paintings are all in pretty good condition. The whole atmosphere is of darkness, heaviness and lowness – very different from what we were to see at Decani. It took around 40 minutes to drive the 20kms between Pecs and Decani monasteries. The latter is 2-3 kms west of Desan town and is signed at the roundabout. Around half way you have to drive through a chicane of tank traps overlooked by a KFOR watch post. The last recorded attack on the church I have been able to discover took place in March 2007 when grenades were thrown at it but doing little damage. At the monastery itself, our passports had to be handed over to a fresh faced young Austrian soldier who gave us a plastic returnable “receipt”. Entry to the monastery required someone from the inside to open the electronic lock but there was no entry fee and, once inside, we were left to ourselves (the only other 2 visitors were leaving just as we arrived). 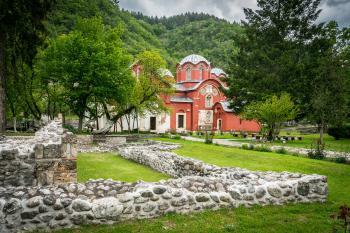 Decani monastery consists of a walled circle of secular buildings surrounding a single church which sits within a lush lawn sprinkled with mature trees – all very peaceful. 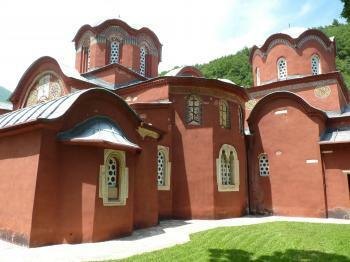 A surprising aspect to us was the lack of any exterior similarity between the design of the Pec and Decani churches. Whilst the first Pec church was from 13th C the other 2 were actually built around the same time as, or after that at Decani (1327-35). Decani is tall with relatively large windows and is marble clad, in complete contrast to Pecs’s low profile, lack of windows and deep red paint (Photo). However, although we are not experts in the artistic styles of the period, to the untrained eye the paintings at Decani covered the same subjects in much the same way as those at Pecs - there was that same painting of a rather surprised Lazarus and the Dormition and the “family tree” of religious personages etc etc. I am afraid that a lot of it just went over our head and ability to fully appreciate. Whilst I preferred what seemed to me to be the darker more “mysterious” atmosphere of Pecs, Mrs Solivagant preferred the lighter character of Decani. If you make it to the area it would seem a waste not to take in both!! By the way Clyde - both Pecs and Decani have a bronze UNESCO nomination plaque on their walls! I visited the Medieval Monuments in Kosovo in April 2016. In particular, I visited the Patriarchate of Pec Monastery. It is a bit confusing because there are no signs, and the monastery is walled off like a military fortress. There is a gate with a security officer you have to go through to get to the site, and you have to present your passport to get through. Once pass the gate it was very straight forward. Just parked my car and walked around the grounds. Read more about the Medieval Monuments in Kosovo on my website. I visited this WHS in March 2016. Out of the 4 sites inscribed the easiest to visit and the only ones open to visitors are the monasteries of Decani and Gracanica. Decani is closer to Prizren while Gracanica is very close to the capital Pristina. Having read that the easiest way to visit Kosovo overland is through Macedonia, I decided to cross the border from Skopje to Pristina and it was pretty straighforward. Having a GPS navigator is only necessary to find Gracanice as there are no road signs whatsoever. There is ample space to park in front of the monastery walls just to the side of the main road in Gracanice. The Serbian flags are no longer paraded as was the case when I passed through the Srpska Republic last year. The first surprise is the tranquil atmosphere as you step inside the courtyard and leave the traffic behind you. The few nuns present were going about their lives and the younger ones in the monastery gift shop were quite friendly and curious even though they spoke no English. When I visited the Gracanica monastery, a baptism ceremony was about to finish so I was lucky to be able to view some of the magnificent old frescoes all lit up even if for a few moments. The 4 columns supporting the main dome are beautifully decorated and the Medieval frescoes pretty much cover all the walls. There was a priest or brother whose main purpose was to make sure that nobody took photos "so as to follow the bishop's orders". Having seen several professional flash photography going on just minutes before my visit, I was quite annoyed as flash photography should be strictly prohibited whatever the occasion so as to preserve the marvellous 700 year old art. So when a few other tourists/locals arrived at the monastery entrance and distracted the priest, I took a couple of quick photos of the frescoes which were in the best lighting and which I liked most. I bought a really interesting book on the monasteries which clearly depicts and describes all the frescoes after my visit. Should I ever visit Kosovo again, I'll surely make an effort to visit the Decani monastery too as has been restored recently, its open to visitors and it's the only monastery with a Unesco inscription plaque! Well known but currently a bit difficult to visit. All monuments are protected either by KFOR soldiers (Gracanica, Pec, Vysoki Decani) or Albanian-Kosovian policeman (Prizren). The road are completely unmarked (Serbian signs were removed) but you can ask people how to get there. First three sights are living monasteries under KFOR protection but they can be visited (secirity check necessary) while Prizren is currently unable to see from inside. From all of those churches my favorite one would definitely be Our Lady of Ljeviš. It is an outstanding example of late byzantine architecture. Throughout its long history it was a holly place for Christians and Muslims, who converted it during the Ottoman rule and named Friday Mosque (al-jumʿa xhamia in Arabic). This name is still in use among Muslim Albanians in the city of Prizren. Unfortunately the devastation of the paintings inside the church - initiated during Ottoman times - reached its peak during the march 2004 riots. The restoration of the site is still in progress. This is probably one of the few WHS where you have to go through military checkpoints (if they even let you) and you'll have several guns and a tank pointing at you before you enter; this place has a rich history with maybe not such a good location. The church looks beautiful on the outside with two different types of local stones. The walls and ceilings inside are covered with Byzantine paintings. There are about 30 monks living inside the monastery and their main task all day is praying. If you are lucky an English-speaking monk will open the church for you and will answer your questions. Father Ezekial speaks very good English, so if you go it might be worth asking for him. He was able to tell us about the history of the Serbian Orthodox church, the history of the monastery, daily life as a monk, and even some surprises: during the war in Kosovo, the (Serbian) monks at Decani protected Alabanian Kosovar Moslems by allowing them to hide in the Monastery. If you like this monastery you should definitely head over to the Patriarchate monastery near Peja: The paintings there are in even better shape and the Monastery is more important (in the Serbian Orthodox Church) than the Decani monastery. The extension of this site to cover other medieval monuments in Kosovo makes good sense from a number of angles. Whatever the political considerations, these other sites probably deserved to be listed from the outset and Gracanica, the only one I can actually speak of, struck me as World Heritage material as soon as I saw it. While Gracanica town, with its history of division, is rather a sad place, the walled monastic enclosure could be in a different country and you have to remind yourself, if you really must, that there is an armoured car - there more for the presence than anything else - outside the gate. The church is very imposing from the outside but appears small and more personal from within. The frescoes - even including one of the foundation charter - are as magnificent as the building. This is one of the great sights of the Balkans and now has the world status it deserves. 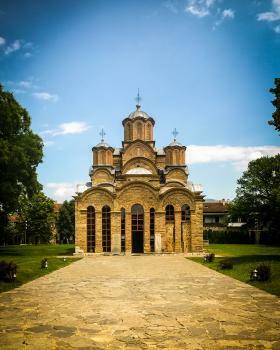 From "Decani Monastery" to "Medieval Monuments in Kosovo"
Gracanica Monastery lies some 10km outside the center of Pristina. It can be reached via taxi, or any bus in the direction of Gjilan. Our Lady of Ljeviš lies in the city center of Prizren, and is signposted. 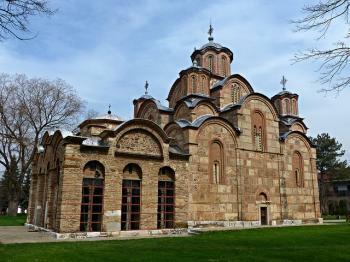 Mausolea: Decani Monastery is Stefan Decanski's masoleum. Mosques converted from churches , cathedrals or synagogues: Our Lady of Ljeviš was converted to a mosque during the Ottoman Empire and then back into an Orthodox Church in the early 20th century. Nunneries: Pecs and Gracanica were both converted to convents after WWII and as of 2017 each houses a community of nuns. Not under control of the nominating state: Site nominated by Serbia (2004), but the area has been part of the de facto state of Kosovo since 2008.